Is your favourite kitchen cabinet marred by old, crumbling paint? And what about that smudgy, once orange cupboard to your left? Here is some good news – you can easily restore them to their former glory with a swift repainting session. Fantastic Handyman has been painting kitchen cabinets for many years now and can breathe new life into sideboards, cupboards, cabinets, and other kitchen furniture of all shapes and styles. The precise experts will work carefully and ensure that any old scratches or scuff marks are successfully masked with a gently applied coat of quality kitchen cabinet paint. The polite and skilled pros are always eager to lend you a hand with proper cabinet restoration. The surface type of your cabinet is also of no concern – the team of professional painters can easily enliven any wooden, melamine, or previously painted kitchen cabinets. If you are not exactly convinced that the paint will be there to stay, the team can also perform a paint adhesion test on a discrete area of your cupboards and cabinets. However, do note that the experts will not be repainting kitchen cabinets that have a wax coating, due to the fact that such surfaces are way too slippery for the paint to adhere properly. 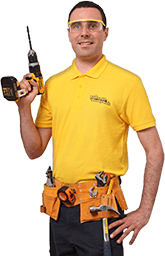 The reliable and experienced handymen in London will ensure that all detachable (and non-detachable) components of your furniture will remain unaffected by the cheerful shades of colour. At the start of your kitchen cabinet repainting session, they will carefully remove any detachable handles, knobs, doors, or drawers and gently put them aside. Once they refurbish the kitchen cabinets in a colour of your choice, they can either re-attach these components back or replace them with newer models that will better fit your home's style. To protect non-removable parts, the pros will ensure that the area around them is thoroughly masked off before putting their kitchen cabinet painting skills to the test. If you have ever tried to paint kitchen cabinets on your own, then you know just how messy can things sometimes get. 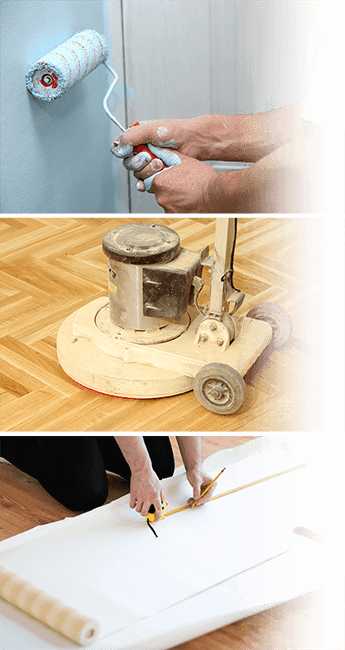 The handymen that we will send at your doorstep know how to hold their paint brushes with an unflinching hand and how to properly protect the rest of your furniture from any stray drops of paint. During a cupboard refacing, a thermofoil cabinet refacing, or kitchen cabinet remodelling session, the tidy handymen will always be conscious of picking up any debris as soon as they fall on the floor. The reliable kitchen cabinets painting handymen operate in all London districts and frequently venture even beyond its suburbs. So, no matter where your home is located, you can always rely on the experts for a professional kitchen cupboard refacing or a complete kitchen cabinet remodelling service. Our polite operators are available 24/7, so feel free to get in touch via our online chat, our easy to use online booking form, or our neat GoFantastic app. You can also contact us the old-fashioned way on 020 3404 4045. Pick what’s most convenient for you and our knowledgeable advisers will happily take care of the rest.